misplaced sense of political righteousness, surreptitiously acted to subvert electoral democracy in our country. The book will examine: How did Hillary Clinton manage to escape prosecution despite compelling evidence she violated the law? Did Peter Strzok, James Comey, Andrew McCabe, Loretta Lynch, and others obstruct justice by protecting Clinton? Why was there never a legitimate criminal investigation of Clinton in the Uranium One case? Are the text messages exchanged between Strzok and FBI lawyer Lisa Page evidence of a concerted effort to undermine the electoral process? Was there ever any real evidence of "collusion" between Trump and the Russians? Did Trump obstruct justice in the firing of Comey or was he legally exercising his constitutional authority? Did the FBI and DOJ improperly use a discredited "dossier" about Trump to obtain a FISA warrant to spy on Trump associates? Should Muller have disqualified himself under the special counsel law based on glaring conflicts of interest? Was fired National Security Adviser Michael Flynn unfairly charged with making a false statement? 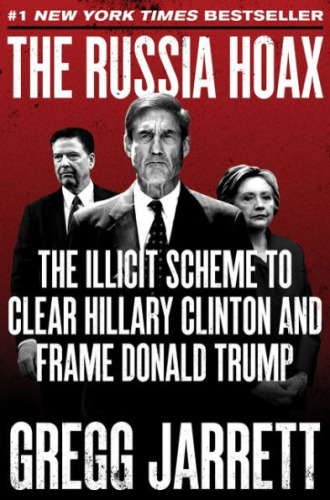 With insightful analysis and a fact-filled narrative, The Russia Hoax delves deeply into Democrat wrongdoing.